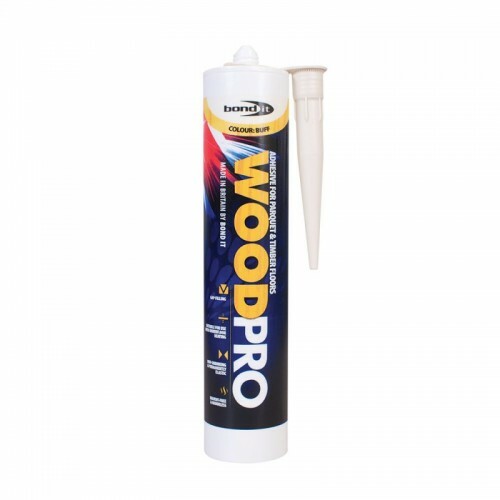 A permanently flexible, one part, ready to use, moisture cure, internal wood flooring adhesive supplied in a plastic cartridge. 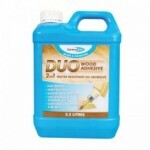 Free from silicone, solvent, isocyanates and water. Based on hybrid polymer technology; Wood Pro reduces the risk of warping or deforming the wood flooring due to its moisture and solvent free composition. For the internal bonding of parquet, mosaic, oak, wood block, laminated, exotic timber and many other wood floor types to porous or non porous substrates including; screeds, chipboard, plywood, concrete and anhydrite. Compatible with substrates incorporating under-floor heating systems. Use the notched nozzle provided for maximum transfer. Apply the adhesive to the substrate in a triangular bead 8mm wide by 10mm high and at 250mmcentres at right angles to the length of the wood. Do not apply more adhesive than will be used within 20 minutes of application. To ensure maximum transfer of adhesive to the wood, lay into the adhesive with a slight twisting motion and tap into place. See Technical Data Sheet for full application details.